Dr. Ciftci received his BSc and MSc degrees from Civil Engineering at Bogazici University in 2007 and 2009, respectively. He acquired his PhD degree from the Department of Civil and Environmental Engineering at University of Massachusetts, Amherst in 2012. 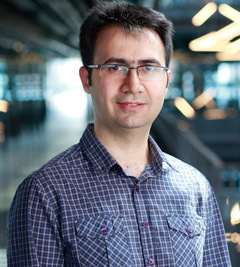 Currently, he is Assistant Professor in Department of Civil Engineering at Abdullah Gul University. His research focuses on mainly (1) the reliability of structures, (2) probabilistic methods in structural mechanics by applying FE modeling on the structures, and (3) fragility analysis of tree structures. Dr. Ciftci presented several important conference presentations (in Portland, OR and Italy) and also has significant 3 SCI-journal publications in high ranked journals such as Trees – Structure & Function, and Probabilistic Engineering Mechanics.